Though her job was to document international new for the public to see and absorb, one cannot imagine the entirety of the atrocities, small and large, seen by journalist Marie Colvin in her decades on the beat as a war correspondent for The Sunday Times out of London. One of her published pieces is only a sliver of each situation. The biographical film A Private War is a collection of those slivers, each with increasing sharpness to cut to the core of our moral constitution. 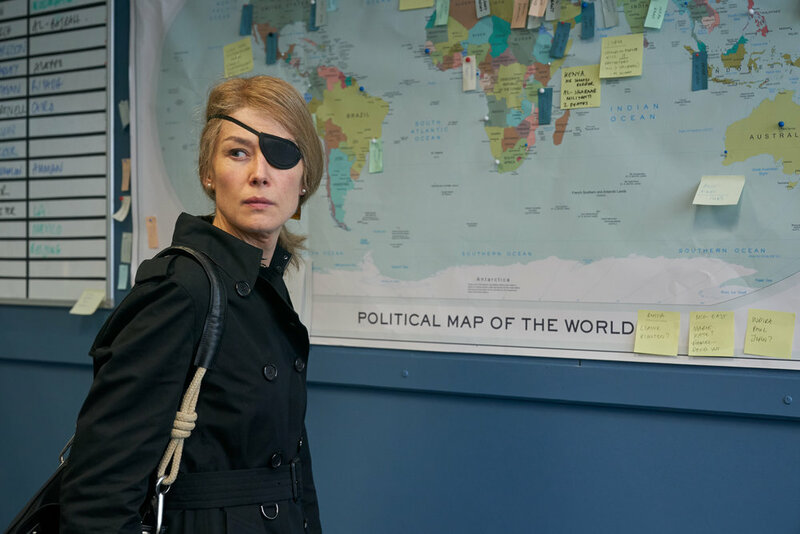 Like each year taking its toll on Colvin, A Private War is the kind of movie that wears you down with increasing tension and toll in the effort to move and reforge your empathetic spirit. Lauded City of Ghosts and Cartel Land documentary filmmaker Matthew Heineman makes his narrative feature debut with this blistering biopic. Gone Girl Academy Award nominee Rosamund Pike modulates her voice register to become the ubiquitous award-winning reporter. Wearing an eye patch she earned from a mortar fire scrape in Sri Lanka, Marie is her own brand of blunt toughness; lighting up cigarettes, downing vodka martinis, and getting pissed at computers after strafing through war zones with little more than that a notepad, a Kevlar vest, a press badge, and her wit alongside her trusty cameraman Paul Conroy (Fifty Shades of Grey lead Jamie Dornan in a revelatory performance of his own). The narrated notes of her analog writings show the polish and grace sanded by her coarseness. Pike chronicles a woman that saw more first-hand war and death in her life than the most professional, experienced, or decorated soldiers. In the many recreated field interview scenes, Heineman often employed actual refugee locals from their Middle Eastern filming locations. Watching them pour their hearts out to Rosamund with chilling personal testimonials, and watching the actress absorb all that as a rocksteady performer, becomes absolutely crushing to observe. Pike’s reactions and emotions are utterly spellbinding at ever turn. This is a phenomenal and ferocious lead performance from Rosamund Pike, who deserves the second Oscar nomination of her career for this combination tenacity and honesty. LESSON #1: THE FEARS OF THE FEARLESS — Looking inside the subject, A Private War makes a concerted and noteworthy effort to show the fractured woman behind the by-line. So often, Marie was immersed in detrimental duality between her own life and the realities she covered. Turmoil clouded distant peace. Career demands pushed away family goals like becoming a parent. Successful stories were built on the uncertain fates of others. Fielding so much hate made it hard for Marie to find love, even with the emerging love interest Tony Shaw embodied by the always charming Stanley Tucci. There was an unraveling madness behind the celebrated figure that A Private War is poignant to present. Marie Colvin also carried the PTSD to prove those troubling fears, an ailment she fully admitted and sought treatment for, both professionally (stints in institutions) and personally (the bottom of those martini glasses) in between assignments dealt out from her long-time editor Sean Ryan (Tom Hollander). From his documentarian’s eye, Matthew Heineman constructs a detailed and compelling examination of modern war, from Sri Lanka and Iraq to Afghanistan and Libya on a tragic march towards the Syrian civil war of the film’s climax. The man is a storyteller, even with dramatization replacing non-fiction. The affecting nucleus, written by Arash Amel (Grace of Monaco), becomes how public perspectives were guided by people like Marie Colvin. LESSON #2: CAPTURING THE HUMAN COST OF WAR — The are two dynamite lines in A Private War delivered by Hollander’s Sean Ryan. The first is “you see it so we don’t have to,” speaking to towering impact of Marie bearing witness to events and truths we should not turn away from. Simply put, she was a recorder of suffering, making her an individual of absolute conviction who wanted those societal scourges corrected through shared information and experience. That leads to Hollander’s later quoted compliment of “you have a god given talent to make someone else stop and care.” That importance is the essence of the entire experience right there.